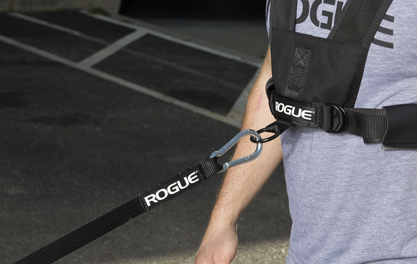 The durable Rogue Sled Harness is available on its own or as a kit with a 9' nylon pull strap and (2) 2000LB rated connectors. The easy-on / easy-off vest is Made in the USA, and features a reinforced internal webbing structure, all steel belt fasteners, and steel anchors (one front, one back). This is a major step above the plastic buckles and easily frayed seams of many store-bought, imported harnesses. 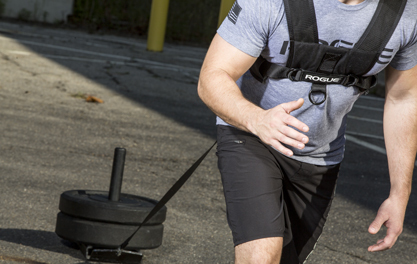 With an adjustable, one-size-fits-all design and fully lined, washable interior, the Rogue Sled Harness is great for one athlete’s use or for multiple athletes in a larger training facility. Includes 3” wide webbing shoulders and a 1.5" wide belt with padded rib guards, delivering maximum durability and superior performance. Stay connected and comfortable while building core strength, endurance and leg power. Along with being easily adjusted to fit any athlete (from adult small to 4XL), the Rogue Sled Harness pairs with the compatible 9 ft. pulling strap to let users drag a sled with the anchor point at either the front or back of the body. The harness is a great accessory to use with speed sleds like the S-35 E Sled, creating a portable pull/drag workout system with a weight capacity topping 500 LBS. The Sled Harness has also been tested for over two years to pull trucks, tires, and parachutes, and can work great for bear crawls and back-peddling workouts, as well. 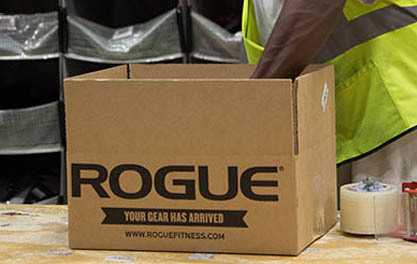 Ordering from Rogue ensures fast, professional, secure delivery of your harness(es) from our Columbus, OH, warehouse, with online tracking available via the Rogue Shipping System. Most orders placed before 3pm on a business day will ship that same day. Rogue Sled Harness is rated 4.7 out of 5 by 11. Rated 5 out of 5 by nnowlin from What I’ve needed for far too long!!! I always find a way to tie the sled straps around my waist, or to looped through a weighted dip belt, and sometimes resorted to feeding my weightlifting belt through the loops. It was obnoxious. Now, I have the freedom of movement to sprint, bear crawl, or pull the sled while flipping tires - it’s honestly a dream come true. I’ve only optested the harness with roughly 550lbs thus far, and its held up (with minimal to no tearing that I can see). The more weight you add though, the faster the straps start to come undone and you play this little game of pulling on them to tighten the harness as you move. But, whatever, it’s still an affordable solution that makes sled pulls more functional and I dig it! Looking back, I wish I would have purchased one sooner! I would absolutely recommend it and fully intend to update my review should anything change. Rated 5 out of 5 by Cathy M from Love the fit and ease of gettng on and off I love this harness. As a female I can find harnesses can rub in and around the chest but this one is perfect. It is also easy to unhook and remove to make WOD transitions much easier. Rated 5 out of 5 by Dr_Dave from Comfortable and versatile! Fits well, makes pulling a sled as comfortable as you can make pulling a sled and adjusts to fit myself, my wife and our teenage daughter equally well. Rated 5 out of 5 by Steve Hampton from Love it Got the harness and tow rope for Xmas. They both do the job very well. Looks like pulling my sled is back in my program, it's better pulling than pushing as I can stand up straighter pulling. Rated 4 out of 5 by Rse84 from It does what it is supposed to I would rate this an 9 out of 10 because it does what it is supposed to. We could improve it by having some thick neoprene padding. Having an ability to adjust the cable length. On a personal preference note having a seatbelt style fastner would also be preferable as it is faster and easier to use. These are minor details though as it works just fine and I have looped the cloth cable to shorten the distance to the sled. Some of you might be windering why I would want an adjustable length cable. We have a limited length of AstroTurf at my gym and I would prefer the ability to pull the sled further before I reach the wall and have to stop. Overall very satisfied. Rated 5 out of 5 by hustleandyhustle from does what you want good fit and finish. a must have for sled work, well worth it. Rated 5 out of 5 by SBravo22 from Great product! I bought this about a month ago & I love the harness for sled dragging Another great product from Rogue. Rated 5 out of 5 by Sidekick from Great harness for sled pulling. I’ve been dragging a sled for many years as a way to increase work without increasing time. I’m not a jogger. Hate it. Love using sled for fast walking and sprint. I go to gravel park trails walk as fast as I can and sprint down slopes or up slopes. Whatever. Just a ten pound weight on sled. It’s enough resistance without changing normal stride. Rogues harness functions much better than original. Wide over shoulder straps don’t dig. In fact the chest plate and lower mounted clip point to the sled prevents any tension being placed on shoulders altogether. This lower pull point also takes a lot of strain off of the middle of my back. It’s a more consistent steady pull instead of jerk/release.